Okay, so it's not quite spring yet in the northern hemisphere, nevermind here in the southern hemisphere, where summer is blazing on. A spring clean is a spring clean, no matter what time of year it is. I went away on holiday over Christmas, leaving my cats at home with a pet-sitter who would come and feed them and play with them for a set amount of time each day. That was great - knowing they were safe, with a professional who had a good relationship with our local vets, and that they'd still get some love and affection and be in the comfort of their own home was a huge relief! I always feel like they come home slightly traumatised when we leave them at a kennel, worrying that we won't come back for them, not to mention the restricted space they have. Anyway, the only downside to this plan, something that I hadn't considered, is that they'd have the run of the house during summer, with no one around to vacuum regularly. As a result, we returned to a house full of cat fur. We had two options: spend the few post-holiday unwind days we had before returning to work cleaning the house... or we could pay someone else to do it. Naturally, we chose the second option. We just don't own enough vacuum bags to contain that much fur* so with the New Year's special that was being offered, it was worth it. To prepare for the cleaner coming in, we spent the night before picking everything up off the floor, clearing the surfaces, doing enough laundry so the remainder fit into our laundry baskets and just generally putting things away. This included my sewing table. Oh. My. Goodness. I really should have taken before-and-after photos. I had my sewing machine and my overlocker both set up on it, patterns, fabric scraps, tailors' chalk, two pairs of scissors, four different tins (one each of thread, pins, buttons and bias binding) and two rulers. All on one table. The floor underneath my dress form was hidden beneath the discarded scraps of paper (from cutting out patterns), bags of fabric that I'd bought and never put away, garments in the to-be-mended pile and broken handbags that I was sure I could fix, if only I had a [insert tool/skill here] - I did manage to fix one with my hot glue gun, but the rest were a lost cause. It was a mess, and I hadn't done anything properly crafty for weeks, even before we went on holidays. It all got put away, the table wiped down and the floor cleared. 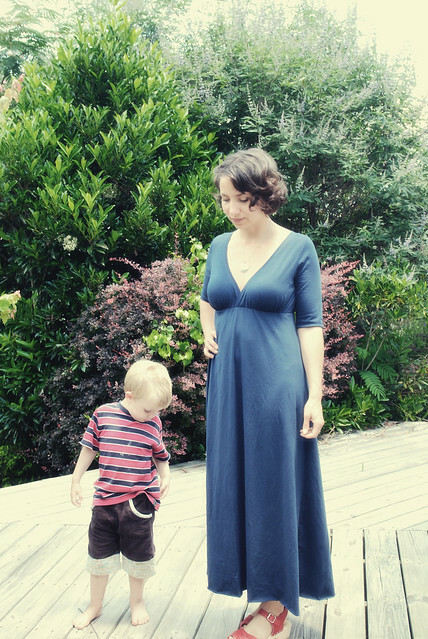 Cut to today, my first free weekend since I returned from holidays, and I'm ready to cross off the last item from last year's to-sew list: Meg McElwee's Surplice Dress from her Craftsy Sewing with Knits class. So the moral of the story: if you're feeling particularly unmotivated to sew/craft, then try cleaning up your crafting space. If you're like me, the exercise required to do it will give you the endorphins to keep going, and you'll remove the obstacles and excuses. I hadn't realised how much the mess was putting me off crafting until it was gone. If your craft space is already clean and tidy, think about what obstacles might be in your way and overcome them. Start with the physical ones first, then move onto the psychological obstacles. If your machine needs a service, get it done! If you've run out of yarn, buy some more! If you're stuck on a technique, take a class or try practising something similar but slightly different - the new perspective might help! Think of it this way: if you had a magic wand that could help with your crafting, what would you ask it to do? What's in your way that you need it to remove for you? What are you missing that it can grant you? Now, with those answers in mind, think about what you can do to achieve those goals. Can you clean your space/ask someone to mind the kids for an hour/defrost a meal instead of cooking dinner? Can you buy/learn/find those missing tools? If the answer is yes, great - go do it! If the answer is no, what's stopping you? What would you ask your magic wand for next? Keep asking your magic wand for help and then solving the problems yourself until there's nothing stopping you from doing what you want to do, whether that's crafting, writing the next great novel or going for a run. Meanwhile, I'm off to make my next summer dress, while there's still time to wear it. Wish me luck and a little help from my magic wand! * I might have been exaggerating just a little bit here. But seriously, the top of my cat's favourite chair looked like it was upholstered with fake fur instead of the black calico underneath.